This little snow-fellow is cheerily waving from the comfort of his frame! The frame is a cardboard slide mount - I think it's the very last one I have left from the first QVC kit I ever bought, so it must be about 22 years old. I covered it in dark blue trellis pattern paper which, like the fir tree backing paper, came from a Poundland pad. I used a stitched square die for the background, going over the lines with a fineliner to produce faux stitching and added a stamped sentiment. Before assembling the card, I used fine silver thread to attach a snowflake charm to the frame. 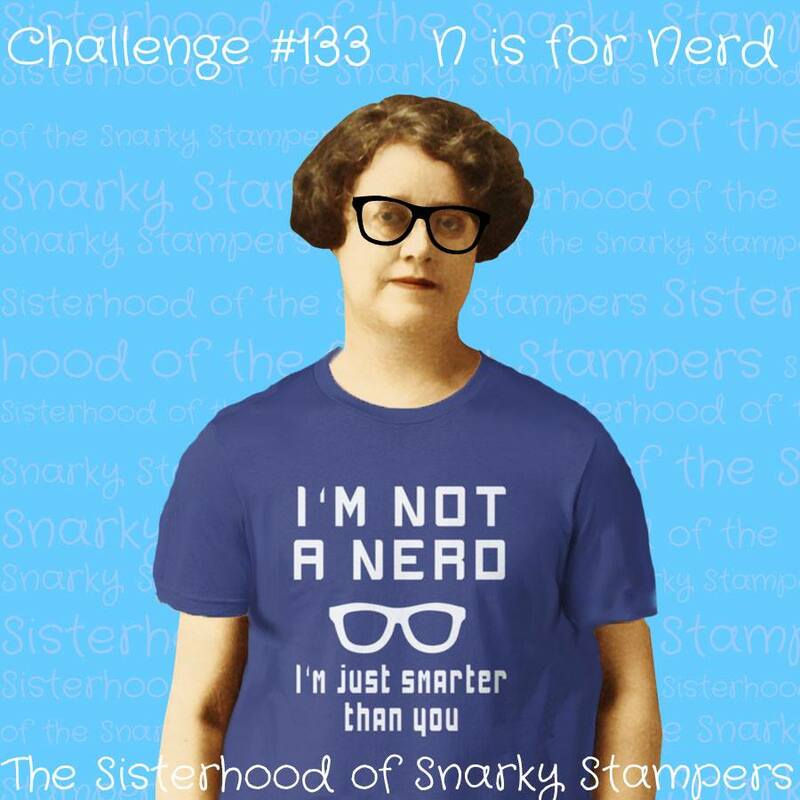 This fortnight at the Sisterhood of Snarky Stampers our challenge is Nerd. And doesn't Edna look gloriously nerdy? Now different people find different things nerdy - maybe Harry Potter or Doctor Who, maybe computers, maybe maths. But as a bit of a science nerd myself, I always think of all things scientific as being nerdy. I'm the kind of person who laughs at jokes like "There are 10 kinds of people, those who understand binary and those who don't." So you'll understand why I already had the Kate Hadfield "Science Time" digi stamp set in my collection. I used the black and white jpgs for this card, using Craft Artist and the atom and molecule images to create a background then superimposing the boy over it. After printing, I coloured it with pencils and added Glossy Accents to the goggles and conical flask. The sentiment - which I borrowed from a list of nerd pick up lines - is computer generated. I keep changing my mind about whether it sounds cute, creepy or downright sinister! 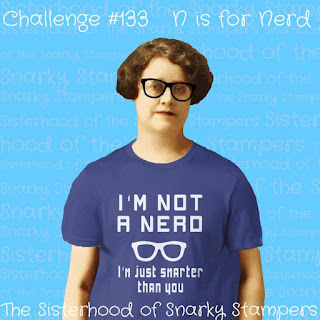 Why not share your nerdy creations with us and see if you can become Queen or Princess of Snark? Crafting friends, some input please. My much loved Grand Calibur is heading for the great craft room in the sky - I can't really complain as it's been used about a gazillion times. Or more. 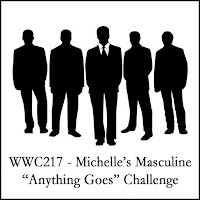 Anyway, I need a new one and I'm looking for ideas which to buy as the GC seems pretty hard to find now. I know everybody with a Big Shot loves them, but don't they take up a lot of space when not in use? I'm really pushed for space and the GC fits very nicely into its own spot, I can't really find any more space than that. I've seen a folding version of the Big Shot, has anyone any experience with that? Or is there another brand or model I should be looking at? I want to be able to cut and emboss. Most of my dies are the normal thin ones but I do have a few of the thicker Cuttlebug dies which i don't want to stop using. Most of my embossing folders are the standard type but i have a couple if the much thicker Spellbinders ones - I wouldn't be heartbroken if I couldn't use those any more. I don't want to move to a smaller, Cuttlebug sized machine as i want to be able to cut large dies. The plates of the Grand Calibur are roughly A4 sized and that suits me perfectly. Finally, i don't want an electronic machine - I had one once and really didn't like it. I love my does and embossing folders too much! 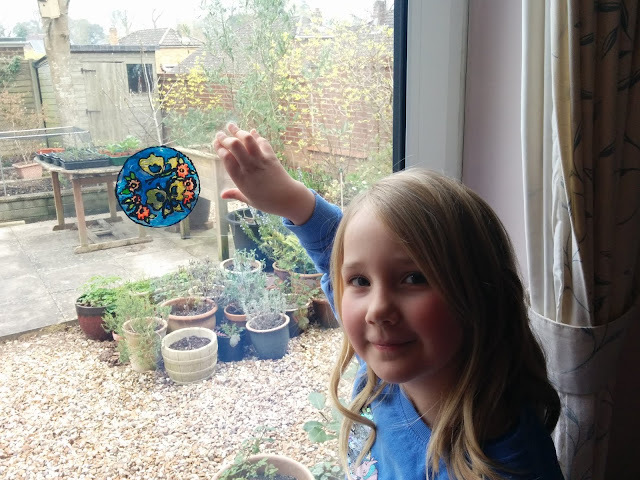 Last week the grandchildren loved their experiments with shrink plastic, so when they came over this week, and once again it rained so we needed an indoor activity, I took them to The Range and we bought a pack of glass paints and outliner. Now I used to be very keen on glass painting about 25 years ago, and much of it I did on acetate to make into cards, so although my paints and outliners were long since used up, I still had all the brushes and a large cardboard folder full of design templates to trace, so we had plenty of ideas to work with. 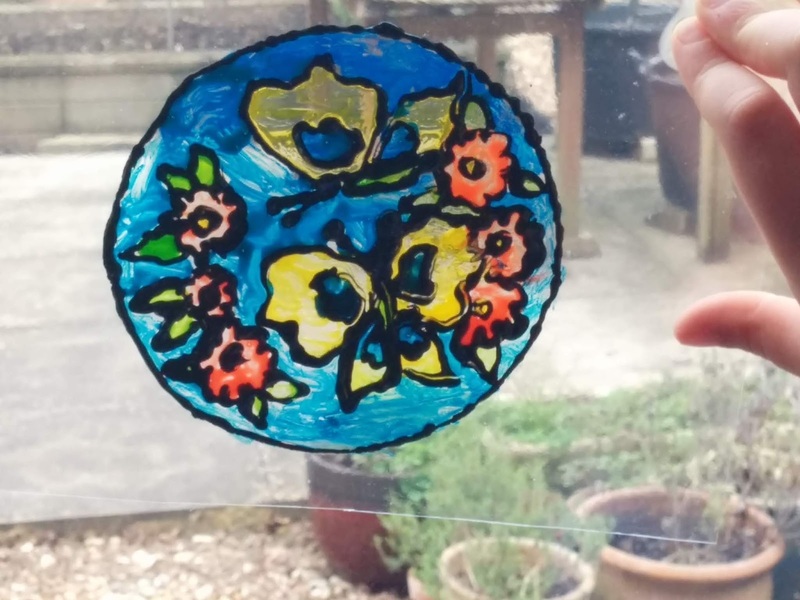 First of all, I showed them how to use the outliner, and got them to choose and trace designs on to sheets of acetate, while I set to to reclaim the acetate packaging so we had more to work with - it would be a pity to throw away packaging that could be used with its contents! We all found the outliner to be rather thick, coarse and hard to handle. 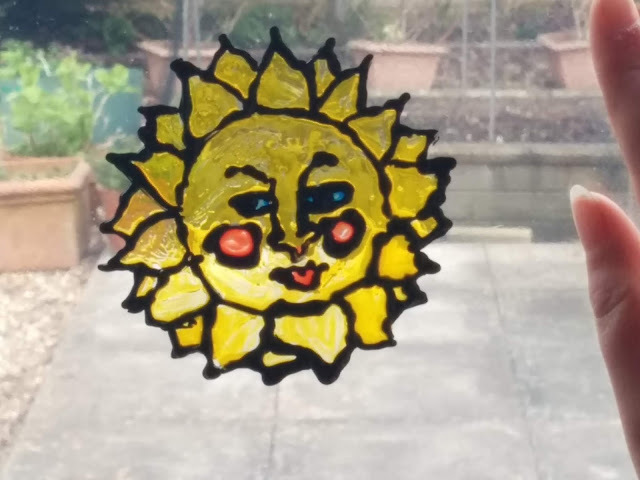 I think it may be designed for use on large areas of glass rather than small designs, so now I have the paints and have rekindled my interest, I think I'll buy the finer outliner I'm more used to. Once the outline was dry - which took about 2 hours and not the 72 hours stated on the pack - we set to to paint our designs. 6 year old Holly is a very impatient girl yet she had chosen a relatively complex design and was totally absorbed in it! 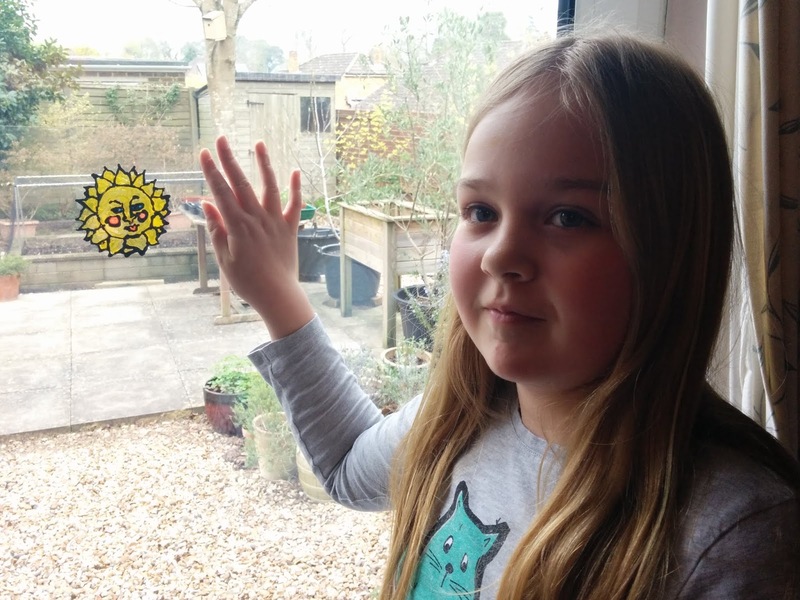 No, you don't get a photo of me holding mine against a window! I love the combo of dark green with gold, especially for Christmas cards, and I think it looks particularly classy used in a CAS way. The die was a magazine freebie several years ago, and oh boy does it need Stick-it adhesive! Those swirls are so very dainty nothing else will do. The sentiment is stamped and heat embossed and I've added tiny flat back gold beads. It's new challenge day at Back to Basics and this time we would like you to use a spray of some kind. It could be ink, water, mica, paint or, as I have chosen, bleach. The background is made simply by spraying the green card with thin, cheap household bleach and then leaving it for several hours to develop. The topper is stamped and heat embossed onto green card and then a bleach filled water brush used to pick out selected areas. In one or two places the bleach seeped out from the embossing, so once it was dry I went over these areas with a marker. It was the closest match I could find but not 100% the same, so I used the same marker to outline all of the main features of the image, to make it look deliberate! As you know, my husband is a keen vegetable gardener so to him spring isn't about daffodils and blossom, it's about seedlings and earthing up and the sight of the year's veg plants peeping through the earth. So that's what my latest spring themed card celebrates. I stamped the speckly earth in brown then masked it and stamped the onion shoots from the Hero Arts "Stamp Your Own Salad" set, added a sentiment from the same set and finished with a die cut wheelbarrow.